Kingaroy’s amazing Josie Potter will be making another splash in Brisbane on Sunday during MS Queensland’s annual Swimathon. But she admits she’s not really known for her swimming ability … in fact, it’s a miracle that Josie is even still with us. In 2013, she suffered a stroke – a side-effect of the multiple sclerosis that she’s been living with since she was diagnosed in 2000 – and it was feared she might not survive. But fortunately she recovered and was quickly back into the swing of fundraising for MS Queensland. Josie’s probably best known for her annual fundraising in the Brissie to the Bay cycle ride with her team of “Kingaroy Cruisers”. They’ve raised thousands of dollars every year for MS Queensland. After her stroke, Josie was introduced to hydrotherapy as part of her recovery and that led to her learning to swim … so, of course, she added the MS Swimathon to her fundraising efforts. 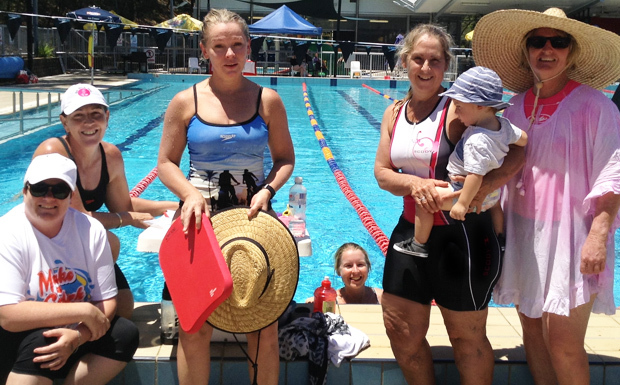 This is the second year that Josie and her team of “Kingaroy Kickers” have taken part in the Swimathon. “There are seven swimmers in the team and they are much stronger than me,” she said. The Swimathon will be run as a relay from 7:00am to 7:00pm on Sunday at the Griffith University Aquatic and Fitness Centre. Team members take turns at swimming 25 metre laps. Last year Josie managed to swim a total of three kilometres across the day, but she admitted she was more useful at lap counting poolside than actually swimming. She said the day also featured a lot of fun stuff for participants as well novelty races. The “Kingaroy Kickers” have set a fundraising target of $2500 for the day but are hopeful of raising a lot more. “I think it’s wonderful that so many organisations and just ordinary people in the community get involved with MS Queensland’s events to help raise money and awareness of this disease. I live with the hope that someday soon we will finally find a cure and say goodbye to MS,” Josie said. “I have the relapsing remitting form of MS and luckily for me I have more good days than bad. If the Swimathon is not enough, Josie is also aiming to take part in the Brissie to the Bay ride in June – her ninth year riding in the fundraiser. She is planning to tackle the 25km course. And she also plans to challenge herself by taking part in a mini-triathlon at Hervey Bay in April: a 200m swim, 10km bike ride and a two kilometre run. Not bad for a woman who when the MS first struck back in 2000 suddenly lost the use of her legs, her left arm, couldn’t swallow and couldn’t see! Fundraising for the event continues for one month after the event so if people want to donate to the “Kingaroy Kickers” they can still do so up to March 10. MS Queensland has been providing care and support to Queenslanders living with multiple sclerosis for more than 60 years. The organisation is committed to helping people get the best out of life, advocating for change and searching for a cure. More than 25,000 Australians are currently living with MS – and three out of four are women. More than 10 Australians are diagnosed every week. In Queensland, there are 3970 people with the disease.